S.Gopalakrishnan: We are here for an interaction between two people who lived for Agra gharana all these years. What we would like to hear from you is about two aspects: one, all these years of your life in Agra gharana, and the other, Agra gharana as such, its contributions to the Indian music tradition, its influence on other gharanas, and its significance and specific characteristics. Lalith Rao: I was born and brought up in Bangalore. My parents must have realised that I was interested in music from a very young age because they used to put records before I went to sleep and when I was three years of age I could recognise who was who and who was singing which raga. So they were very keen that I should pursue music. So at the age of about 11, they asked Pandit Ramarao Naik who was a very renowned teacher in Bangalore to come and teach me at home. And I think from then on my life has been with Agra gharana. Before that when I was about two years old, I believe my parents took me to listen to an all-night concert of Ustad Faiyaz Khan saab and I believe I sat through the whole concert without making a noise. So I guess maybe that is when the dice was cast. For me that Agra gharana was to be my future musical journey. Pandit Ramarao Naik belonged to the Agra gharana. Now in those days in Bangalore you didn’t have much of a choice as to whom to learn from or what to learn from. Nor were my parents aware of all those diversities that exist. And he was a good teacher. So it was as if the die was cast. There was no choice. And he came into our lives. And that was how I started learning. And he belonged to a very traditional school of thought. In those days they were very traditional both in their daily life and in their approach to the music because they had learnt from gharanedaar musicians. But he was a very forward thinking in the way he taught. I think Bharati will agree to that. He was not rigid in the way he taught which you would expect from a teacher of that generation. He was very open. And he had a knack for bringing out the best in his students. If he found somebody good at picking up various ragas, he would not stick to one raga. If he found somebody good at bandishes, he would teach him that. He made things interesting. And he didn’t make it drudgery or something where you would start wondering ‘Oh! Is he coming, is my teacher coming home this evening?’, because unlike their generation we were all people who went to school, who had other activities. Music was not our sole activity and I thinkthat was true for all in our generation. Our parents taught us music not as a profession but as something to be learnt, something to be enjoyed, and later maybe if we were good at it, then we could take it up but it was never meant to be a profession. It was meant to be mainly a pastime, at least in my case. So it was not as if we had to practise for so many hours. He could not lay down those rules for us because the conditions at home were totally different. And he realised that which I think was a plus point in his favour because that was how he kept the interest of his students. And he was able to train so many of us on the performing stage. M.R. Gautam, Lalita Ubhayaker, Lalitha Ramanujam, Meera Savur, myself, Bharati, Shantha Jayatheertha.. Then there was some people who learnt like Suman Nagarkatte. He trained so many youngsters into performing musicians. Whether they reached the all-India stage or not doesn’t matter because that depended not necessarily their capability; but they had other things to do, many were housewives. But he had a remarkable talent for bringing out the best in his students and for raising them in the traditional stamp. So that was how I started learning and performing. Now performing comes not necessarily because of someone’s effort , yes, partly due to effort, but also because of the talent one has been blessed with. Some people may learn, they may be very interested, they may be very dedicated, but they do not have that musical quality which make them a performer. S.G.: The role of creativity. L.R. : Creativity maybe there but there are so many things that go into all this. So maybe God blessed me with that. My circumstances, my parents were supportive. So I did start performing after three years of learning from him. I gave my first concert for Bangalore Sangeet Sabha. When I grew up music was never the topmost priority, or in my parents’ priority. It was always studies. And they did not want me to do only one thing. So I was encouraged to play games. I was encouraged to do various activities. So this continued. And then at that time my knowledge of Agra gharana was very basic. I knew I belonged to the Agra gharana and when some Agra gharana musicians came here like Sharafat Hussain Khan or somebody, my guru would say, go and listen to them. But those were days when recordings were not available, tape recorders were very rare. So it was mainly music through the radio. And that was also restricted because in Karnataka, we had limited exposure to North Indian music. So maybe your exposure to gharanedaar music was on the national programme in AIR. So I remember listening to national programmes of Vilayat Hussain Khan, Sharafat Hussain Khan on Saturdays. I think most of us grew up that way. And then I focussed on my education. And music went into the background for quite a few years. It was only in 1967 when I got married and we moved to Delhi that music which had taken a back seat re-entered my life. And I started learning from Pandit Dinkar Kaikini who was then stationed in Delhi and was also part of the general Agra framework. So you may ask why I didn’t go to Yunus Hussain Khan saab who was there. But as I said my knowledge of the gharana was very little. And we knew Dinkarji because we had heard him singing right from my childhood. He used to come to Bangalore very often and so it was natural that we went to him. And it was a continuation of the same thought processes, the school, the way of learning, everything. And it was mainly a sort of brushing up, brushing off all the cobwebs, getting back into that musical frame of mind, and he was a brilliant performer and a very brilliant teacher also. So he was able to help me get back into that musical frame of mind. But before we could progress on that journey, we were transferred to Bombay. And that is when for me at least the Agra gharana became a pivotal point. My entry into the gharana really started from there. Why did I go to Khadim Hussain Khan saab? Or you can ask how did you hear of Khadim Hussain? Because as I told you I didn’t know much about the gharana. S.G.: Before getting to that, tell us who were the other Agra musicians with whom you were familiar? L.R. : You see, when I grew up in Bangalore, as I told you, on the radio you come to hear of Vilayat Hussain Khan, Khadim Hussain, Latafat Hussain, Sharafat Hussain but there are so many musicians in the country and if you remember if one week north Indian music was broadcast, the next week used to be the turn of south Indian music. And there are so many musicians. So the chances of hearing say even Vilayat Hussain or Khadim Hussain or anybody more than once or twice…. L.R. : Not even in a year. It is only 52 weeks, so 27 artistes per year. And there were so many musicians from the gharana. So maybe once in three to four years, or four to five years you would get the same artiste again. So my exposure was mainly to Dinkarji who used to come here and to Chidanand Nagarkar who belonged to Bangalore, who belonged to the same Agra branch of Ratanjankar. They were all Ratanjankar students. And also because our community was the major one which supported north Indian music, maybe that is how these people came here. Then Gindeji used to come. S.A.R. Bhatt used to come, Chidanand….So my exposure was mainly to this branch of the Agra family. And my exposure to the Khan saab’s was mainly through what Ramarao said or through few recordings which were hardly negligible. So then, why did I choose Khadim Hussain? When I was young and studying here, we went to Bombay once. My mother’s cousin was Saguna Kalyanpur and she used to learn from Khadim Hussain Khan saab. And once we went there, she said would you sing? I was about 13 or 14. So I said fine. As a child, as a 13 or 14- year-old, you have no problem. Someone asks you to sing, you sing. You don’t think, 'Oh! is this the gharana, am I singing right?' And it was a fun thing for me. We were just singing. Her (Saguna Kalyanpur’s) uncle used to come and stay with us and he always used to tell me, 'Oh! you must listen to Khadim Hussain Khan saab.' He taught Saguna Kalyanpur and so that was my only link to Khan saab but I never thought of it because we were in Bangalore and he was in Bombay. And there was no chance of me being sent there. So the question didn’t arise. So I began to sing and there were only a few friends present. Then there was a knock on the door and somebody walked in, not very tall, very slim, dark with a dhoti and kurta and a waistcoat. I didn’t even notice him or rather it didn’t enter my head that he could be a musician. He came and sat down and I sang. I don’t even remember whether Sagunaji told me that this was Khan saab. And you see we were not aware at that time about how you would react when an Ustad came, how you react when a senior musician comes. We were not schooled or we were not exposed to the niceties or that way of life living in a place like Bangalore. So after I sang, Sagunaji came and told me, this is Khadim Hussain Khan saab. Now that rang a bell. So I did touch his feet and then he said, ‘No, no, I am glad I came because you sang well and Ramarao belongs to my same gharana, so I am very happy, I will give you my blessings.’ And then he left. Just a sentence. Fine. We were sitting around, having lunch with them and then there was a knock on the door again. So he walked in again. So he came in and he said, ‘Do you mind if I tell you something?’ So I said, no, not at all. So he said to me, he said, ‘Because you belong to my gharana, you are like my own disciple. And the Desi that you sang was very nice except for one small portion. I don’t think your teacher would have taught you that way. This is because he is like a brother to me, belonging to the gharana. I am sure he didn’t teach you like that because that doesn’t fit in with the form of Desi. Go back and ask him and if he says no, what you did is not right, correct it because you are the future of, all of you are the future of the gharana and we have to see that’. And then he left. And I was really struck by this gesture because in the scheme of things he would have never seen me again, I would have never seen him again because I was not a professional musician nor was I planning to be. And this was some chance meeting where he heard me and he took this interest. It showed the dedication of that man to the gharana, to the music, to youngsters who had literally no connection with him except that in the general frame of things they belonged to the gharana. And I was totally impressed by that. And I decided that if ever I went to Bombay I would learn from him. So then when we moved from Delhi to Bombay, I was sure whom I wanted to learn from. Many people told me, why do you want to learn from Agra gharana, it is a very difficult gharana, it is a male-oriented gharana and there are so many other musicians here and he belongs to the old school, his teaching methods are old, there are so many younger musicians who have learnt a lot, who have music colleges, but I didn’t have any confusion in my mind. My mind was made up and that was what I was going to do. And it was so sweet. We rang up Saguna Kalyanpur and said, 'Now we have come to Bombay, please tell us where he is because I would like to go and ask him if he will come and teach me.' So she said, 'Fine, I will let him know. I will call you back.' So after a few days—we were living in Malabar Hill in my father-in-law’s house—there was a knock on the door. Knocks on the door seem to be very important in my life. So we opened the door and there stood Khan saab. I was literally stunned. We called him in and he says, 'I am Khadim Hussain.' (Pointing towards Jayavanth Rao,) He opened the door. So he said, ‘There is nothing big about it, it is only that after tying the knot, I officially accept you as my student.’ I didn’t realise the significance of ganda-bandhan then. It was not a restricting term as people think now. Some people think now that if you are a ganda-bandh shagird of somebody then you cannot learn from anyone else and that it is restricting you or limiting you to learning only from him and nobody else. It is not that. It has a very interesting thought process behind it. In the gharanas what used to happen was that there were lots of musicians. Some used to teach, some used to perform. Now what happens, there was no internet those days, there was no TV, only radio. Everybody wants to learn from people who are famous. Everybody wants to learn from Faiyaz Khan saab, everybody wants to learn from Sharafat Hussain, everybody wants to learn from Bade Ghulam Ali Khan saab. Now so they accept you as a student. Then what happens? They are touring all the time. They are performing. So what happens to your lessons? So any other Ustad from the gharana, if you go to them and say please teach me, they have to say yes because you are part of the gharana and you are ganda-bandh shagird of somebody from there. It was like a brotherhood where you were free to go and ask anybody from the gharana. And this must have happened very often say with Faiyaz Khan saab and Atta Hussain Khan Saab in Bombay, in Baroda because the former had a lot of students but he was performing all the time. So Atta Hussain Khan saab was the teacher of many of the Agra gharana students. J.R.: Most of those who claimed to be Faiyaz Khan’s students were really taught by Atta Hussain. L.R. : And the extent of Faiyaz Khan saab’s teaching was only that when he performed in the evenings, they would sit behind him or in front and imbibe what they could. S.G.: It could be applicable to all these musicians who were touring. L.R. : Could be. I know that this was the routine in our Agra school. So ganda-bandhan has a very beautiful thought behind it. And Atta Hussain used to teach so many people because he was mainly stationed there as a teacher. And so it was like a complementary thing when the person to whom you had a ganda-bandhan ceremony, he was there, you learnt from him and when he went, your teaching was not disturbed because there was somebody else from the family or the gharana to take over that teaching process. J.R.: The classic example was Saguna Kalyanpur. She used to learn from Anwar Hussain Khan who was the younger brother of Khadim Hussain Khan. Anwar Hussain passed away very young, so immediately Khadim Hussain Khan took over. That was the tradition in the gharana. L.R. : And Vilayat Hussain Khan saab used to teach some people in Bombay. And then when he moved to Delhi, automatically Khadim Hussain Khan saab went and I believe Vilayat Hussain Khan saab used to say, ‘It doesn’t matter, I am going but my nephew is there, he will come and teach you.’ So they never let the student down. At least I like to think of it that way. Because it was not a restricted thing. It was as if you took care of the student in more ways than one. So that was how my life with Khan saab started. And I was very lucky in one thing. Both Khan saab’s and Ramarao’s approaches to music were the same. They never laid down any rules that you have to sing this way, you have to sing like this. The bandish, the raga, yes but afterwards, the elaboration, as long as you are within the raga framework, your taal was alright, they would allow you to imagine and create. And then if they found something lacking, they would correct you. So they never stifled your creativity. S.G.: What is imagination according to Agra gharana? L.R. : You have the basic framework of the raga. Suppose you take a certain phrase; in how many ways can you develop that phrase? In all Indian music, we have the basic framework of the raga and then whether it is north Indian or south Indian, you see the bandish or the composition and then you develop that. That portion is the creation, creativity because the bandish is set and the raga is set in the sense that the framework is there. So how you develop, that is the creativity, that is the basis of all Indian music whichever way you do it. Each one chooses differently. In Agra the basic thing is we do not do note by note elaboration. This is the base of Bihag. Now when we are elaborating we don’t do (Singing) sa…ni sa….sa ni sa….sa sa ni sa ga….ni sa……..
You are taking each note and doing all the various combinations, that is not the approach of Agra gharana. Not that it is wrong. Each gharana has a different perspective. We believe that a raag is formed not by just the notes but by certain phrases which characterise or give you the picture of the ragas. So this will be the basic, I would never stress…..(Singing….) I wouldn’t do that. See we are using phrases. (Singing…) So it is a series of phrases which you join. So this is the base of our approach to a raag. S.G.: And there the imagination differs from person to person. L.R. : Suppose you take a phrase. I take a bandish. (Singing…) Kaisa samjavoom…This is the mukhda….. So what else do you use? You use the length of standing on each note, the way you connect the notes. You sort of give emphasis to certain note, take back, make certain notes lighter, act little frills, add little gamakas, so you are giving a whole lot of intonations into that. Let me see if I can do it for you. It is almost like as if you are telling a story. S.G.: Is this conversation happening between you and the raag, or you and your own imagination? L.R. : No, your imagination and the raga and the taal, everything is there. You are talking to somebody. Imagine you are talking to somebody else. You are telling them the story. Then you get involved. It is not that you are singing notes. It is not that you are making various combinations. That is also imagination. That is also imagination. Because you are creating different sound pictures. But what we are doing is we are adding words to that. So we are adding a different dimension to that because when you are listening, for us language forms a very important means of communication, doesn’t it? So if it is just a sound, fine, you are listening to it. If there are some words with which you can associate, with which you can make some sense, your mind also starts responding to that music in a different way. That is only there if you understand the language. But even if you don’t understand the language (Singing…) I am sorry, my throat doesn’t work. So this is what we mean by elaboration. In that there is a continuity. You are not using words in isolation. Kaise samjhaoon sakhi ri jiya ra kal naahin pare─those are the words. I can go on elaborating ‘kaise’, it is not wrong. It is a different approach where you are giving more importance to the raga and the development rather than the bandish. But then Agra, we give equal importance to all the three. So it gives a different picture. S.G.: And you don’t think that it is limiting your experimentation or innovation with ragas? L.R. : You can (experiment) because you can use simple aakar and do the elaborations in the middle. We can; it is not forbidden (singing...) We do that but with the help of words we get a lift. At least that is the way I look at it. Maybe they will think that it is inhibiting. I think it all depends on the way you have learnt, the way you have been exposed to it. And then each one’s individual personality: some people like to do aakar, some people like to use words, some people like to use gamak, some people like to use khatkas and meends. It is a personal equation with the raag and with your music. Your gharana or your school or what you have learnt forms the base. But for it to be able to take shape, for it to be able to become almost a living identity when you sing, your personal taste, your personal choices, your personal likes have to come into that. Otherwise it becomes mechanical. You have practiced taans, you have practiced paltas, you have practised even these bol alaap and you rattle them off. That is beautiful, I am not saying it is not beautiful because it shows the amount of practice, the amount of riyaaz, the amount of time, attention you have given to perfecting that. But to give it a soul, to give it life, you need something more. That is my way of looking at it. My Khan saab would always say ‘Har ek ko apni jagah hai'. Everything has its place whether it is gharana or bandish or raag, everything, whether it is a man, everything has its own place and we should not think of anything as bad and we should not criticise anything. Everybody has his own likes. I like this, you like that, let each thing be. I think that is a very beautiful way of looking at things because each one’s concept of what is beautiful changes. So what I think is beautiful in your music, somebody else might think that is not beautiful but that does not make it not beautiful. It is still beautiful for someone at least. So this principle of live and let live, I think that is the greatest gift that Khan saab has given me─to be able to accept that there are different ways of looking at things. L.R. : And he would come for anybody’s concert if he was invited and he would sit right in front. And he would encourage the person. He would say ‘Waah bete! Kya cheez! Bahut acche!’ And I remember once I was not at all impressed by somebody’s singing and here was Khan saab sitting in front encouraging. And next day I said, ‘Khan saab, why were you encouraging him so much?’ So he said to me, ‘Beta, uska jee bharna chahiye na'. He should be satisfied and encouraged fully. Only then his inherent talent will come out. If we sit with a long face, then he will get a little scared and whatever is there in him will not be showcased. J.R.: That was the broadmindedness of the Ustad. L.R. : These were all little nuggets (of knowledge) which he gave me and which I think were very important for me to understand what that gharana is. S.G.: You were mentioning that Khadim Hussain used to encourage disciples to listen to other gharanas. How were their exchanges between the gharanas? L.R. : We cannot generalise about these things. Some gharanas were very rigid. Some gharanas weren’t. Now we believe, or it is very easy for us to say, they were rigid but think of those days, there was no transport, there was no radio, there was no internet, there was no whatever. You had to go by bullock cart or maybe the train, and even when going by train you had to have the money to go. So what happened was that, when these people grew up in these various communities or places, their music developed its own characteristics. Now to go and learn from someone else, you have to go all that way, you have to go and stay there. So these characteristics of the gharanas became very synonymous with that gharana. Somewhere else they developed certain other characteristics maybe based on one famous singer of their school. So then everybody wanted to imitate him. So that is mainly how these characteristics might have developed. So then it is very easy for us to say, they were very rigid. We don’t really know. And there is a very beautiful example in Khadim Hussain Khan saab’s life itself which he told me. Alladiya Khan saab of the Jaipur-Atrauli gharana was in Bombay in Babarnath. And Khadim Hussain Khan saab and Vilayat Hussain Khan saab were also in Bombay in Babarnath. Do you want to continue? J.R.: Yes, what happened was Alladiya Khan saab suddenly had to leave his house. Now immediately, Vilayat Hussain Khan saab, whose wife was related to Alladiya Khan saab, went to Alladiya Khan saab and said, 'Come and stay with us.' So they stayed in the same house for a good two years and in those times there used to be a lot of discussions between them and each one was discussing the aspects of each other’s music. And Khadim Hussain Khan saab says, he used to call him Dada Alladiya Khan saab because he was so much older, ‘Dada Alladiya Khan saab has taught me quite a lot of things, taught me dhamar and rattled off some ragas like Shudh kalyan, Dhanashri, Sawani', ragas which are not very common. And thereby, between the two's discussions, now many Jaipur cheezas and Agras cheezas are common, Nayaki kanada, Mero piya rasiya, Khambavati, Alee ri mat jai, so many cheezas are common between these two gharanas. L.R. : And the way they sing the raags are common to these. We cannot pinpoint and say, This was taught to that gharana by this person, that was taught to this…because these things don’t matter and also those people are not there for us to check with and we are not trying to prove which gharana taught whom what or anything. But there was this interchange. And now in Agra gharana what happened was that Faiyaz Khan saab’s wife belonged to the Atrauli gharana and Vilayat Hussain’s mother, Natthan Khan saab’s wife, also belonged to the Atrauli Gharana. When they got married, there is a famous story you might have heard, Faiyaz Khan saab’s dowry was 500 compositions. Now what happened when you get a dowry of 500 compositions? You learn their gayaki. So you are enriching your gharana. And they usually married from some other gharana. So naturally that style, a little bit, not everything, but a little bit of that style came into your system. And also there was a rule that one learnt from not only from the father and father’s side but from the mother’s brother. That means you are getting a wealth of information about another gharana. So then that gets added. They were not historians. I think Indians have not at all been good as far as history is concerned. Our history, I think it was only the British who really sort of gave us our sense of history, otherwise it was like, Okay, we did this, we did that, they never bothered about recording who taught what, who did what, nothing, it was just continued. S.G.: When it comes to performing arts, most of the gharanas were cutting across dances and music, things were transferred to the new generation not through texts at all, not through documented history at all. L.R. : No, it was oral. S.G.: Always it is oral. Therefore, this oral tradition mainly is applicable when it comes to vocal music. And then I don’t know whether I did the right thing or the wrong thing. I believe I did the right thing. Now I could have easily gone home and quietly written the notations. But I didn’t. Because I believe that for a guru-shishya relationship there has to be perfect trust. If there isn’t perfect trust, the transfer of that tradition, there will be something lacking. Because for them their music is their whole life. And they expect complete trust of the student in them. Now if Khan saab had got a slight inkling that ‘Oh! This girl…’ and had known that I had written down the notations or somewhere if he got some doubt, then that beautiful relation that existed, some flaw would arise in it. And then that whole milieu gets vitiated. So I decided that and he knew that my devotion to him was total. And I am very lucky that I have got students who are like that. Because I believe it doesn’t work otherwise. I could have gone home and written the notations but he would have known because 10 months later when he asked me to sing that, I wouldn’t have known it the way he expected me to know it for the simple reason that I would not have worked on it. But in this process what happens, there are some things which are forgotten, some things which are lost. S.G.: How do you see that? L.R. : Some things like now I have learnt something which I believe Khan saab sang like that. I don’t know. I don’t remember. So I make up my own little twirl. I can. Not realising I am making it up but knowing the raag, knowing so many bandishes, it will be in the scheme of things. S.G.: There is an argument in these oral traditions, there are some teachers not only in music but in literature or academics, who don’t allow their students to take notes in the classes. They say that what you listen, that is very important. If you are missing certain things, it doesn’t matter. Indian history goes like that. In the oral tradition a lot of things are missing but there is a beauty in what goes forward. L.R. : And also if certain things are missing, I don’t think the student has the capacity to reproduce everything that the teacher did in the way he did, even if you recorded it. Or note it down. So what difference does it make? And our arts and music and dance and all are not so limited that if certain little things are missing, it is going to be that much less precious. Because the next generation will add to it. Every generation has added, so maybe we have made up in some way. Yes, some raags I have forgotten. I only have the name of the raag and the bandish. And these are not sung, not performed. So now there are some raags which I look at and nothing comes back to me. But fine. The musical world is big enough to exist without them. I mean that is one way of looking at it. S.G.: (To Jayavanth Rao) Going back to Agra gharana, how can we take this discussion forward? Now this young man didn’t know that music is music. But then Natthan Pir Baksh who had learnt from this Ghagge Khuda Baksh’s grandfather some dhrupads said, ‘Come, I will see what I can do for you.’ For two years he got him to do just svar sadhana (voice training), nothing else but svar sadhana. Slowly his gruff voice became less and less and less rough, and it became particularly sweet. Side by side he taught him khayal. So the khayal sort of merged with the dhrupad that he had learnt earlier. And after 12 years of intense riyaaz and learning, he went back to Agra. And then he was welcomed with open arms because when they heard him singing it was like, ‘This Ghagge has got the sweetest voice in the family’. And the new style developed. Now what happened? The Agra-dhrupad style and the Gwalior-khayal style started merging. So now you take Faiyaz Khan. How did he start his music? He would start with a nom-tom alap first in the raga like the dhrupadiyas do and then he goes on into khayal the way the khayaliyas do in Gwalior. So it became a homogenous whole. And then came the great influence of Daras Piya. Now everybody has heard of Mehboob Khan ‘Daras’. Vilayat Hussain’s father whose name was Natthan Khan who died in 1901 before Khadim Hussain Khan was born, he was married to Daras Piya’s sister. Now this tradition that she mentioned, that you learn from your uncle, so all children of Natthan Khan, that is Vilayat Hussain Khan, Mohammad Khan, Abdullah Khan, all these, they also started learning from ‘Daras Piya’ because mamaji, uncle. So that style started coming here. In the next generation, Daras Piya’s daughter married Faiyaz Khan and she mentioned 500 bandishes as a dowry. Apart from that, Faiyaz Khan was such a great musician and getting all these dowries in the form of bandishes, Ata Hussain Khan, that is Daras Piya’s son and his brother, Bande Hussain Khan, Daras Piya told them, ‘You go and stay with Faiyaz Khan’. So they moved to Baroda, both the brothers moved to Baroda. And as she mentioned Faiyaz Khan was an itinerant musician. He used to go to Mysore, Bombay, Allahabad, Benares, Calcutta. So who taught them? Ata Hussain Khan. So the style of Atrauli started getting into the Agra ustads. At the same time Ghagge Khuda Baksh’s two sons, Ghulam Abbas Khan and Kallan Khan who were traditional Agra musicians because they had learnt from that joint Gwalior-Agra tradition, started teaching the Ustads of the Atrauli gharana. Now Khadim Hussain Khan, although he claims to be an Agra gharana musician was born in the Atrauli tradition because he is Daras Piya’s nephew or grand-nephew. Sharafat is Daras Piya’s grandson. And they married─Datafat and Sharafat─married the daughters of Vilayat Hussain Khan of Agra. So there was so much intermingling that you can’t tell which aspects came from Atrauli, which aspects came from Agra just as you can’t tell from Ghagge Khuda Baksh which aspect is Dhrupad, which aspect is khayal. So the whole style became so homogenous that Khan saab used to say ‘Hamare gaane mein 18 ang hain–Our singing has 18 angs (parts)’. And everybody treats Agra gharana today as layakari only. It is not. Not at all. As she mentioned how you do the bol-banav. Bol Banav is the most interesting aspect. It touches your heart. The way she sang 'Kaise samjhaoon'. In raag when you do that, it touches your heart. So that is the real crux of the most beautiful aspect of the Agra gharana. And layakari is only a part of it. L.R. : And you realise why because it was a dhrupad gharana. So Dhrupad means dhrupad dhamar, the laya is very strong. Now what the Agra followers did was they did not forget their dhrupad moorings. They used parts of it. Now we are all taught dhrupads dhamars a little bit depending on our capacity and then we use that also, our laya base is strong. Now what happens is down the line some people get into layakari and they are fascinated by it. And maybe they overdo it. That is one of the charges levelled against the gharana that there is only layakari, there is nothing else. Yes, I admit some of the musicians have overdone layakari to such an extent that it becomes harsh or it becomes not so palatable. But these are all individual likings. That does not remove the other aspects of the gharana that maybe are not being used. They are still there. S.G.: Could you tell us about these 18 angs? L.R. : I can’t remember all the 18. S.G.: A general idea will do. J.R.: It starts with alap, raga-alap. Then it starts with the bandish. Then bol. J.R.: Really 18 angs. Different taans, sapat taans, vakr taans. L.R. : They are not angs. Meend, ghaseet, lagdar, those are the angs. J.R.: The fact is that there are 18 angs. If you ask me what is the crux of Agra gayaki, it is sur ka lagaav—how you apply the sur to the words. The way she sang the bol-banaav. That is the crux of the gharana. But it has these 18 angs and some people concentrate on something else. Now today musicians sing, I think, vilambit for 10 minutes and then for the remaining half hour they sing only taans. I have listened to so many of the youngsters today. They think taan is the ultimate in Hindustani classical. They go on rattling off taans one after the other. Where is your bol-banaav? Where is your sur ka lagaav? So the Agra gayaki has all the aspects. L.R. : It is up to each person who is singing to pick up the ang that suits their style and temperament. Now if some people don’t pick that up, that is their (loss). 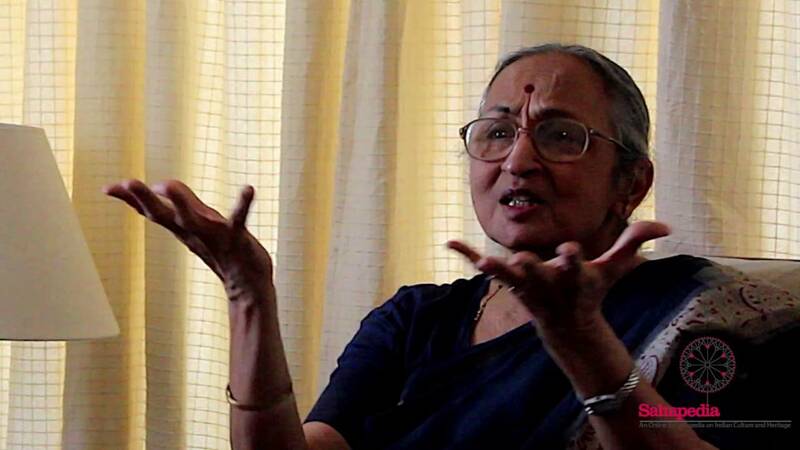 Bharati Pratap (disciple of Lalith Rao): Almost all the attributes what Agra gharana can offer, I think we are blessed to have been getting it from Lalitha Aunty. She tells us what the voice throw is, to sing with an open voice. That is why I think of all the musicians in this gharana, she has set a trend, a major trend because it is actually male-oriented. They say it is mardaani gayaki (male-oriented singing). S.G.: I wanted to ask about it. People say that it is mainly male-oriented. I am not convinced. But the great maestros in Agra gharana happen to be males. J.R.: What about Zorabai Agrewaali? She lived from 1860 to 1922 and hers are among the first HMV recordings. Have your heard Zorabai Agrewaali’s recordings? Did you hear that Kajra ri in Gaud Sarang or that Puriya, the alaap part in two minutes─how she beautifully develops and then goes on to sargams and taans. Now Zohrabai Agrewaali is early 20th century. L.R. : The thing is Khan saab used to say that there are 18 angs. There are some which are definitely masculine angs like gamak taans and all. Now if you do that too much, your voice can get spoilt. But you don’t have to do it. You have to take those angs which suit your temperament, your voice. But what happens as I told you, now Faiyaz Khan saab was a musician who had a very strong build and a very robust voice. Now he could do gamaks and all these gamak taans and bol taans that require a lot of effort, effortlessly. Now if we think that okay, this is the style and we try to imitate that, naturally your voice may not be able to sustain it. So the thing is the gharana has whatever it has. It is up to you to choose what suits you. You will get the style because the way you approach the bandish, the way you sing, everything is there. That puts the stamp. But what aspects or what angs you try to elaborate your concert with─that has to be chosen. S.G.: We were discussing about the alaap, bandish and all. Thumri, tappa─these type of segments, how did they come into the gharana? J.R.: Primarily from the Gwalior gharana. As I said Agra originally was a Dhrupad style but Gwalior had all those. Tappa for instance is a speciality of Gwalior. L.R. : But in Agra, they don’t normally sing tappas. But they do sing thumris, mainly bandish thumris. But there have been like, Faiyaz Khan saab has sung beautiful thumris. My Khan saab used to sing, they all used to sing. But mainly they sing Dhrupad dhamar, khayal and bandish thumris. Once in a way they do sing the other thumri, dadra but very few tappas. S.G.: What could be the reason? L.R. : Maybe the voice culture is not tuned to tappas. I don’t know. At least my voice was not suited for tappas at all. S.G.: Okay, then when it comes to voice you say that your voice culture was not suitable for tappas. Then how is the voice culture in Agra Gharana different from that of other gharanas? L.R. : We have an open-throated full (voice). Khan saab would always say, Khule gale se bolo. Sing with an open voice. Yahan se aana chahiye. It should come from here. So the voice is full-throated. Articulation is with full voice. We don’t use the falsetto. Even some of the light (phrases) and even the taans are very forceful. There are a lot of forceful taans. So when you get used to singing like that, all the little trills and the fast, maybe they get lost, I don’t know, but (gesturing towards Bharati) she has it, she is able to because I don’t insist on her singing with full voice. I do tell her but you cannot afford to spoil the voice quality that someone has. But in the olden days, I don’t know whether they paid attention. They must have but you see what happened in north India was that because of the Muslim invasions over so many centuries, the musicians were not a settled lot. They had to flee from here, flee from there. And when you have peace in the country, then all the arts flourish for which I think south India has been luckier. In north India when there are invasions, when there is looting, this, that and everything, what happens was that the arts get suppressed because people don’t have the time to sit and listen to all this. They are busy looking after their lives. So then especially in many of these musical gharanas, they had to flee from place to place. When you go from place to place, what do you do? They have thrown so many of their things away. And then you are teaching, then some days you want to go somewhere, you have to run somewhere else, so what do you teach, what are the things you value most? Your bandishes and your ragas. So maybe they thought, Okay, let me teach the bandishes and the ragas, the voice culture we can (ignore for now). So over a period of time, what the rules of their voice culture were, that I have not been able to find out. All Khan saab would tell me is, ‘Lambi saans lo aur khuli awaaz se gao’. Take a deep breath and sing with an open-throated voice. Now that can mean so many things. S.G.: You were mentioning about the invasions there. In the first music conference in Baroda Professor Bhatkande talked about how the invasions affected the north Indian music whereas it didn’t happen in south Indian music. My thinking is that because of the non-influence of the Islamic culture on their musical traditions, though the traditional classical (Carnatic) music remained the same, it didn’t get any further influences. L.R. : But in north Indian music I feel we have benefited. There are always plus points and minus points to everything. We may have lost out on some things like voice culture or whatever and we may have lost out on some of the bandishes not being written down, there may be mistakes in the wordings, some wordings have no meanings because you don’t know what your teacher taught you, you don’t know what his teacher taught but we have gained from the creative aspect, we have gained so many bandishes from them, we have learnt their languages. Yaman is supposed to have come from there, nobody knows, but their influence has definitely played a part. S.G.: Yes, major part. That didn’t happen in Carnatic music. L.R. : And also the Mughal rulers supported the arts. So which meant that music and dance did get a fillip for some time during the Mughal rule. Now afterwards Aurangzeb came, then the whole British thing, all that, that is history. S.G.: The oldest Muslim population in India is from the south. Kerala has the oldest Muslim population. J.R.: Because of the Arab trade. S.G.: Because of the trade. They came through trade and not through invasion. But when it comes to Carnatic classical music, even now, even though Tamil Nadu has a large Muslim population, you won’t see a (non-Hindu) performer. L.R. : There was Chinna Moulana sar. S.G.: Only in Nadaswaram. I am talking about Carnatic music. You will not see a Brahmin (performer) on Nadaswaram. J.R.: That is true, that is very true. L.R. : Yes. But another thing happened. In north India what happened, like in Akbar’s court, in Agra gharana the same thing happened, they were all Hindus before. Now during the reign of Akbar, Haji Sujan Khan converted to Islam and went to the Haj and came back. Maybe the rulers preferred Muslim performers as their durbar court musicians. So many of the Hindus either converted or they gave up music. But one thing I really appreciate about these ustads, they never forgot their Hindu compositions which were handed down. Like Khan saab and all, they have taught me so many of the Hindu compositions, they could have easily said through the generations when they became Muslims, why should we sing Hindu compositions. There are so many beautiful Muslim compositions, let us just teach (them). Now when I teach my students, naturally I am going to teach them what I like or what I value most but for them that distinction was not there. As far as music was concerned, there was no religion. He was God whether you called him Allah, whether you called him Ishwar, whether you called him Krishna, Siva, whatever. They used to sing Hindu bandishes with the same devotion that they sang Muslim bandishes which I think is a very beautiful aspect of our art and culture where religion has no part. Bharati Pratap: Not only did they sing, Khan saab even composed. L.R. : And most of them composed on Krishna. My Khan saab composed most of his compositions on Krishna. I developed a very nice equation with him. I treated him more like a father or a friend, not as a…of course there were some things that were sacrosanct. I dared not question. But other things I sort of…I used to ask him, I said, ‘Yeh kya baat hai, aap musalman ho aur apne sab bandishen kanha ke upar banaya, Krishna ke upar, yeh kaise ho sakta hai. How is this, you are a Muslim and you have made all bandishes on Krishna, how can this happen?’ Why? So he said, ‘Lalitha, sangeet mein mazhab or religion ki jagah nahin hai’. There is no place for religion in music. There is no place for Muslim, Hindu in music and if I tell you the truth, songs cannot exist without Kanha. Now look at their thought process! Of course they were staunch Muslims in the sense that he sent his wife to the Haj but he did not go to the mosque. We had taken him to Haji Ali, to the Nizamuddin Dargah, he did go to Bareilly, in that sense he was a Muslim but when it came to music, there was no religion. I think that is their greatest, I would call it, gift to north Indian music. Like even now we sing bandishes of both, irrespective of what the content is, with the same devotion that it means. I don’t know if in the south this sort of thing has happened but in the north this has happened. We have Sufi compositions, we have Muslim compositions, we have Hindu compositions, we have shringar ras compositions, there is a large variety of compositions. S.G.: Could you mention some important characteristics of the gharana? L.R. : Full-throated vocalism. Emphasis on purity of raag. A very great selection of ragas, the repertoire is huge in terms of ragas, in terms of compositions. Now the terms of compositions, even Gwalior has a lot of compositions. And all these Ustads, these traditional musicians, in each raag they knew 13-14-15-20 bandishes but they could do that because they had the time. For them music was their life. They had nothing else to divert their attention. So bandishes, layakari, the angs of classical. Bandish plays a very important role in the scheme of the raga development. Different types of taans, full throated voice, layakari, and you develop the raga with the help of the bandish. S.G.: You said about the purity of raga, can you elaborate? L.R. : Suppose you have a very small repertoire of ragas, then you don’t need to be very particular. At least that is my way of looking at it. Maybe I am wrong. Suppose you have a huge repertoire, how many notes are there? Sa, re, ga, ma, pa, dha, ni, and komal and teevr (notes), so altogether 12. In 12 notes if you have 600-700 raags or 500 raags or even 300 raags, how are you going to keep that? If you do a certain phrase with the same notes, it becomes a different raag. If you do the same notes with a different way of combination of notes and the emphasis you give to notes, the length of time you stay on each note it becomes a different raga. Now unless you keep by purity of raga, I mean this, that unless you know all these things, you can easily go from one raag into another. It is sacrosanct if you are particular about that. But if your repertoire is not that big? S.G.: And when it comes to Agra gharana? L.R. : Yes, we are very particular because the repertoire is big in terms of raags. There are so many types of banadas or bhairav or sarang-prakaar or malhar ke prakar or this or that. So any slight shade, it goes into another raag. Now if you don’t know those raags, it doesn’t matter. You are happily singing. Now when you know that those raags exist, then you have to take care that you don’t go from this raag into that raag when you are singing this raag. It can’t be written down. It is in your mind. Some people are compiling it. I am trying to compile it. I think some people have done it but not a full scale. I have recorded some bandishes, some 250 odd bandishes for University of Seattle, in Washington, in Seattle, all Agra gharana bandishes taught to be my Khan saab. And the University of Washington in Seattle has done a very good job. They called Pandit Ginde ji and they recorded a lot from his Bhatkande School. Then they called Yunus Hussain Khan and recorded his. Then they called Sharad Sathe. Then they called Dagar Brothers. SRA (Sangeet Research Academy, Kolkata) has done a lot of archival projects. I was their coordinator for the Ford Foundation Project. Then I did archive 100 compositions from Balasaheb Poochwale of the Gwalior, Yashwantbua Joshi of the Gwalior School, Ratan Pai of the Atrauli gharana, like that. And then it was continued by Kumar Mukherjee. And they overlap. Gwalior bandishes are also sung in Agra. And then some Gwalior bandishes are also sung in Rampur. Now the singing style may vary but the bandishes are the same. And maybe the approach to the bandish, the way the bandish is sung also will vary depending upon the style. Agra will use more meends and gamaks and things like that. Gwalior will use more quick elaborations, and so it is highly fluid but it needs to be done because we don’t have the time or the energy to devote that much time to music or learning any more. Otherwise those bandishes would be lost. S.G.: Yes, it would be lost. J.R.: But there are lot of archives all over. J.R.: What she started to do in both Washington as well as Calcutta, they are there. They are all archived. And Sangeet Natak Academy has archived some. Then I think many universities also have done it. S.G.: IGNCA also is doing this. L.R. : So each individual organisation is doing something. Now the need I feel of the hour is to put it altogether and sort of make it available to anybody anywhere. S.G.: Actually all these archives are closed. No access. Suppose if one wants to get into these archives, it is not possible. Can you say something about the great masters of the gharana? J.R.: Okay, about the great musicians of the gharana, you look at it from the time the actual gharana started. The Agra gharana as a gharana started immediately after Aurangzeb because he banished all the musicians. So all the state-sponsored musicians went to their own places and the gharana musicians of Agra came to Agra and settled down there. The greatest musician of that gharana is Ghagge Khuda Baksh. Now Ghagge Khuda Baksh had two sons. One was a brilliant performer, the other was a brilliant teacher. The performer was Ghulam Abbas Khan. Apparently he was such a fantastic musician, he was made the court musician of Jaipur. His father was the first court musician of Jaipur and that was passed on to Ghulam Abbas Khan. He could sing a taan in one breath for 18 avartans. I mean to sing in one breath in one avartan itself is difficult. He could sing it for 18 avartans. This is what Khan saab said. And he had such a control of his breath and health that he lived up to 107 and retained his sur till almost the end. Now his brother Kallan Khan was among the greatest teachers and Khadim Hussain Khan saab’s guru, Faiyaz Khan’s guru, Vilayat Hussain’s guru as a teacher, Kallan Khan. So that was the early 19th-century generation. The next generation among the top musicians was Natthan Khan who was taught by Ghulam Abbas Khan himself. Now he is Vilayat Hussain Khan’s father. He was considered to be among the top musicians of the (time). Then you go to the next generation, Faiyaz Khan. Faiyaz Khan was treated as the musician of the century. So Faiyaz Khan was big. And then you come across the performing musicians and the teachers. Among the top performers of the next generation were Sharafat Hussain Khan, Latafat Hussain Khan, Yunus Hussain Khan. And among teachers there were Khadim Hussain Khan, Anwar Hussain Khan, Vilayat Hussain Khan. So it is all in the family, either in the Atrauli side or in the Agra side. So these were the great musicians. But their disciples who really made name and fame, there are quite a few. Now you start from Khadim Hussain Khan, his disciples, those who really made big name, apart from Lalith, I don’t want to say anything because I think it will become parochial. But Baban Haldankar; there was a lady called Vatsala Kumthekar, apparently she was one of the top but she died early. And then my own aunt, Krishna Udyavarkar, she was doing her MA in Lucknow University. At the age of 18 or19, she used to perform in the National Programme along with Faiyaz Khan. She was a disciple of Khadim Hussain Khan. Like that there are so many among his disciples. But those who really made name and fame, Ramarao Naik’s student is M.R.Gautam. You may have heard the name. He was very erudite. L.R. : And what happened is right from the beginning they taught everybody, not just the Muslims. So if you see Natthan Khan saab’s disciple was Bhaskarbuwa Bakhale and Bablibai. And then you have Faiyaz Khan saab had so many disciples. Ratanjankar, Dilip Chandra Vedi, then Sohan Singh. Now Ratanjankar, see this gharana is literally like a banyan tree. What happens, you have branches, and then from there it lets down roots. So you can say that and that is able to exist as an independent tree, if you cut the connection. So there you have, if you take Ratanjankar as one of those, he had his whole school of disciples. Ratanjankar was an extraordinarily brilliant composer, musicologist, teacher, everything. And he learnt earlier from Bhatkande-ji and then from some others. But then he came to Faiyaz Khan saab. Bhatkande himself took him to Faiyaz Khan saab. So he trained Dinkar Kaikini, Chidanand Nagarkar, Ginde, Bhatt, Sumati Mutatkar, Chinmoy Lahiri, so many. Now they in turn have their own disciples. So you see it is literally like a banyan tree. And then from there that group comes. Then Ata Hussain, he trained Sharafat Khan saab, he trained Ramarao Naik, he trained Poornima Sen. Now Ramarao Naik came to Bangalore. Now he has become another sort of a banyan tree with his own set of disciples. Then you take Vilayat Hussain Khan saab. He had so many disciples. Now Jagannath Bua Purohit had his own set of disciples. Manik Verma, C.R. Vyas, Yashwantbua Joshi, all of them. Now they all may not have all the characteristics of Agra because each guru brings with him his own contributions plus what he had learnt from his guru─there are two things, two aspects. I am not able to absorb everything that my guru has taught me. One. Second, certain aspects of what the guru has taught me, I don’t like or they don’t sound good in my voice, I am not happy with it, so I discard that. I add my own. So then each stage you are deleting something, you are adding something. But some trace or some common thread of the gharana goes down. S.G.: That is the trunk of the banyan tree. L.R. : Yes, that is the base if you look at it that way. And each one has its own characteristics. Their disciples take some of the guru’s characteristics plus one or two from the main, then they add their own. So it is an eternally changing, evolving. There is a base and how much you take from there, how much you add to your own and now with internet, with radio, with TV, (it all depends on you). And then now I listen to somebody. I am fascinated by that music. You may say that I will not try to imitate some of those things. But I will. To what extent I am successful is not the question. So some of those elements will come into my music. So as I said, the Agra gharana has been a gharana of teachers and they are very open teachers. And with the amount of ragas and bandishes at the back of their gharana, they are willing to give freely. Now how much you take depends on you. What you take, which aspects you take depend on you. So you can’t blame the gharana for something that somebody is singing. Because it has come through various stages of change. J.R.: Interestingly each century, each era, one of the top musicians had to be from Agra gharana. As I said Ghagge Khuda Baksh was treated as the most sweet-voiced musician of his time. L.R. : They never invited him to sing at weddings because when he sang, everybody would cry. J.R.: They had tears in their eyes. He was so soothing. L.R. : So they said in a wedding you should not cry, so don’t call him. J.R.: He was so soothing. And then came Natthan Khan. He was considered to be as fluent in sur as in laya. L.R. : He was the first aasthan vidwan (royal scholar/musician) of Mysore durbar (of) Krishna Rajendra Wodeyar. J.R.: When he came and sang here, Mysore maharaja was, all his aasthan vidwans till then were Carnatic musicians. When he heard Natthan Khan, he was so impressed, ‘No, no, you have to come and be here.’ So he actually moved from Agra and came and lived in Mysore. First Hindustani musician, aasthan gavaiya (court singer) of Mysore durbar. L.R. : Then he and his son, Abdullah Khan together were made aasthan vidwans and I don’t think it has happened ever, a father and the son as Aasthan Vidwans at the same time. J.R.: Because he was so impressed hearing the son when the father was teaching him, ‘You are as good as your father, you also become aasthan vidwan.’ And then for a short time Vilayat Hussain took that place. L.R. : And Faiyaz Khan saab was also…. J.R.: Not aasthan gavaiya but the interesting thing is Faiyaz Khan was the aasthan gavaiya of Baroda. When he came and sang in Mysore, the Maharaja requested him. So he said, no, I owe my allegiance to Baroda. But then I will give you a title. Aaftab-e-Mausiqi. That was given by Mysore Maharaja and that stayed with Faiyaz Khan as his stamp. It was Aaftab-e-Mausiqi Ustad Faiyaz Khan. That was given by Mysore maharaja. So each generation had one of the top musicians of the generation was from Agra gharana. L.R. : And whether the musicians, they belonged to the khandaan or they were disciples, that capacity of teaching continued. See Bhaskarbuwa Bakhale, so many students, Ratanjankar, so many students, Ginde ji, Dinkar Kaikini, Nagarkar, Bhatt, so many students, Ramarao Naik, so many students. I mean there is something that brings in that urge to teach. Baban Haldankar, he has got so many students. L.R. : Bhaskarbuwa Bakhale and Vazebuwa. For a Muslim Ustad in those days to admit that! J.R.: ‘Unke saamne main chavanni hoon.' I am next to nothing in front of them. L.R. : And he said, ‘Vakayi woh bhaskar thay’ They were like sun. They were very generous in that generation. And there was that, Natthan Khan saab once said to Alladiya Khan saab─they had performed one after the other─Natthan Khan saab was supposed to have told Alladiya, ‘Jahan tumhara gala jaata hai, wahan mera dimag bhi nahin jayega’ That means you can sing so fast and so beautifully, even in my mind I cannot imagine. Look at the generosity! And they were professional musicians! They had that greatness which I don’t seem to find now. Maybe I am being pessimistic but I find they were very generous in that. And they were very true and very gentle, honest people. S.G.: Would you like to say something about your guru? Bharti Pratap: I have absolutely no words to say anything about her except that she is not just a great guru, a wonderful human being. And we are all very blessed to be under her guidance. Of course Uncle is always there. I don’t see them as separate. You just saw how Uncle spoke. It has been a very great learning experience. It is only after I came to her that I could see the depth in this music. Until then it had been a superficial learning, very shallow. But she was the one who has been showing me the horizon and she is an ocean of knowledge.